Please Note: We will be closed Tuesday, January 1st. 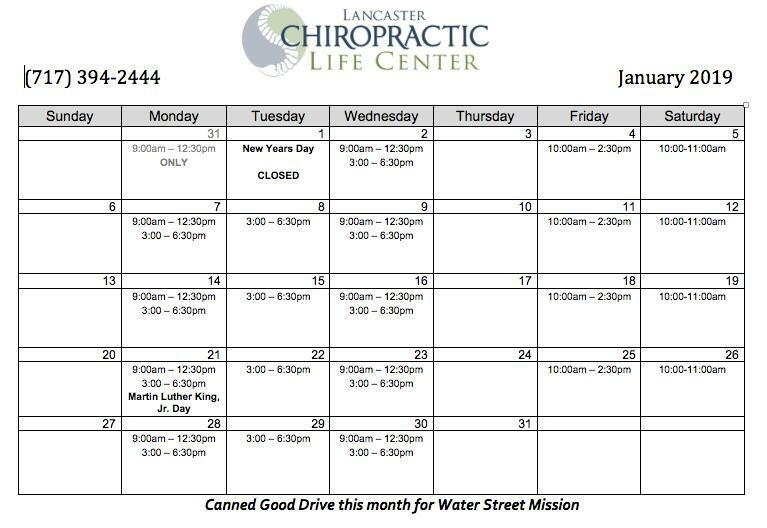 Winter Food Drive: The Entire Month of January we will be collecting non-perishable food items for the Water Street Mission. New Patients will receive their first visit at the cost of one full bag of donated goods during this time. Did you make a New Year’s Resolution for 2019?  40-50% of North American adults make one or more resolutions each year.  The most popular New Year’s resolutions are about weight loss, exercise, and quitting smoking. Also popular are resolutions dealing with better money management and/or debt reduction. Although it appears that many people who make resolutions do not succeed in achieving their goals, the same research shows that people who do make resolutions are 10 times more likely to attain their goals than people who don’t explicitly make resolutions. So, set your sights on making one this year. And, if you’re not sure what to do, put your health and wellness at the top of your list, and make it a priority to see your chiropractor. 1. Get regular chiropractic check-ups – Research has shown that in only 2 short weeks of having the LIFE FORCE choked off, the effected cells begin the process of irreparable damage and dying. So, the ONLY way to know is to be checked (and adjusted if necessary). 2. Exercise regularly – movement prolongs the life of all bodily systems. Make it a habit to take the stairs, or to park a little further away than usual from your destination. 3. Drink 8-10 glasses (8oz.) of water every day – the body consists of at least 65% water, so keep replenishing your fluids with clean, filtered water. 4. Think positively – good thoughts lead to good feelings, and good feelings contribute to good health. 5. Sleep at least 7-9 hours per night – sleep is restorative for all systems of the body, and good quality rest is priceless! Most importantly, isn’t our first wish for each other a ‘Happy’ New Year? Focus on being happy this year. Start by appreciating what you have now. Then, look forward to your New Year’s resolution as a means to enhance your already rewarding life with meaningful new behavior. Chiropractors recognize that if you address the cause of the symptom, the body will no longer have a need to produce it. 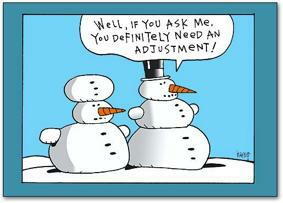 That’s why Chiropractors focus on fixing underlying problems and not superficial effects. Chasing after symptoms is like a dog chasing its own tail – spinning around and around until it gets dizzy, confused and frustrated. It’s much smarter to address the underlying cause from the start.